It is remarkable how art allows us to examine contemporary facets of culture and magnify the impact of complex present issues – often, without even uttering a word. Dance and other performance arts can be the most expressive when interpreting ideas or concerns that are relevant, yet somewhat intangible. Combining the portrayal of real-life events with an investigation of the modern influences of technology and politics, The People Movers and Juventas present an ambitious, emotive performance: HackPolitik. The People Movers is an emerging contemporary dance company that “fosters artistic collaboration, abstraction, imagination, and the expansion of physical and mental boundaries.” Its mission is to explore the abstract qualities of our world while inspiring thought and emotion through performance. The company’s projects are the embodiment of artistic director Kate Ladenheim’s unique and imaginative vision. 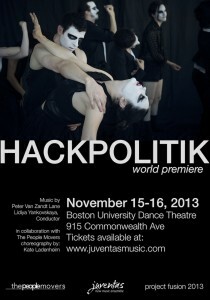 HackPolitik, premiering this month, is an incredible example of The People Movers’ dedication to choreographing deeply meaningful, abstract performances that invite audiences to explore their own understanding of contemporary social issues. Inspired by the high profile, infamous Internet-hacking group “Anonymous,” HackPolitik is an artistic examination of the ways in which politics, power, and technology intersect. 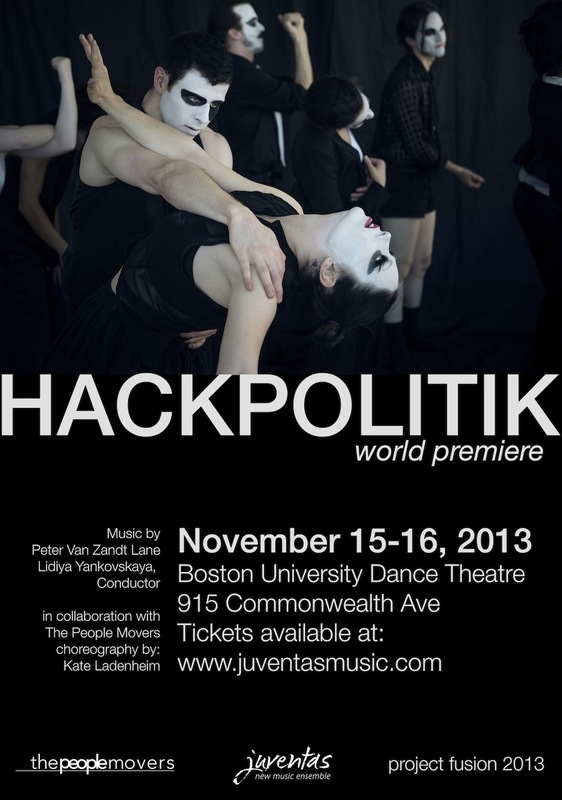 Featuring music by Peter Van Zandt Lane and conducted by Lidiya Yankovskaya, HackPolitik was made possible by Juventas New Music Ensemble, an organization that commissions and performs new works by emerging composers and choreographers. Juventas works in a collaborative process with these artists from a production’s initial conception until its final realization. HackPolitik is influenced by observations about how technology has irrevocably changed our world, how it has redefined innumerable, intricate pieces of our lives. The People Movers explains, “HackPolitik is a surrealist investigation, through music and dance, of how we engage politics through technology in the 21st century. The plot of the piece is based on true events. It explores the thin line between activism and anarchy, anonymity and ego, gender identity and personality.” The investigative performance piece is also described as being “intensely character-driven” in its exploration of the mindsets of Anonymous’ members as they riskily engage in online political activism through hacking. Inspired in part by the 2010 attacks of leading corporate websites, HackPolitik will conceptually demonstrate the social implications of how powerful institutions were temporarily dismantled by extremely skilled “hacktivists.” Using music and dance to artistically explore contemporary socio-political issues, HackPolitik is choreographer Kate Ladenheim’s ambitious, nuanced entry into evening-length performance. She says, “Anonymous, as a catalyst for massive social and political change, gives us an incredible amount to explore artistically. One of the most intriguing ideas for me is that our online personas are inherently performative and that we are able to, in a sense, craft a version of our ideal selves,” of the vision behind HackPolitik and its noteworthy universal relevance. In an outstandingly creative way, HackPolitik will illustrate choreographically how interactions involving technology are inherently abstract. The movements and music will be conceptual and emotional, mirroring true events and both the subtle and glaring ways that technology plays a role in our lives today. For more information about HackPolitik, visit The People Movers’ official website.